Briefly: Allyson Healey is your typical good girl. She always does what she’s supposed to do: behave correctly, make great grades and take the college and career path that her parents have envisioned for her ever since that day she saved someone with the Heimlich maneuver. Planned, accepted, end of story. But what if those plans could change? What if Allyson could step out beyond those expectations and take a chance on something spontaneous, random, capricious? What if she could be someone else? And what if that becomes an adventure that completely changes her life? While waiting to see Hamlet performed by the Royal Shakespeare Company, Allyson and her best friend, Melanie, decide to ditch it and go find a troupe of actors who had handed her a leaflet. Guerilla Will – Shakespeare for the masses. She never does this sort of thing, especially since Allyson is on a tour that her parents had given her as a graduation present. She didn’t even go to pubs at night with the rest of the kids. That’s not what she does. But this is their last night on the tour, and there’s something about the warm brown eyes of the actor who handed her the flyer. Can she be impetuous for just one night? She can, and she is. She and Melanie are leaving early the next morning to catch a train to London to stay for a few days with Melanie’s cousin. But when those brown eyes show up on her train, and she actually finds herself flirting with this boy from the play last night, Allyson feels like a completely different person. And when they arrive in London, she is presented with one of those major forks-in-the-road: should she stay with Melanie in London and eventually return to her planned and regular life, or should she throw caution to the wind and travel to the one city that she hadn’t been to that she really wanted to see: Paris? This may be the only chance she will have to be completely free, so she goes with Willem for one day in Paris. After all, it is for just one day. Didja Like It? Gayle Forman never disappoints. Her stories, conflicts, dilemmas, action – they are all so real that anyone reading her books can easily put themselves in the shoes of the protagonists. There are so many subtle nuances that are in play as well, and while the tales are laced with hints and forshadowing, they are never brash or trumpeting. This story is about taking control of your own destiny, but it isn’t overwrought or artificial. It’s a simple theme, but instead of a balloon animal, it turns into a Macy’s Thanksgiving Parade dirigible because of the characters, the city, the mystery and how this one impulsive act incontrovertibly changed Allyson’s outlook forever. Anything Else to Mention? There’s so much to talk about, but there’s so much intricately intertwined that I don’t want to give anything away. Suffice it to say that you will love this book and will understand the conflicts that that Allyson has as a person who, while getting ready to take that first step into adulthood, is still very much under the influence of her parents. Only she can decide whether that’s a good thing or a bad one. Or a little of both. To Read or Not to Read: Well, this time, that’s not the question. How many times to read takes its place. 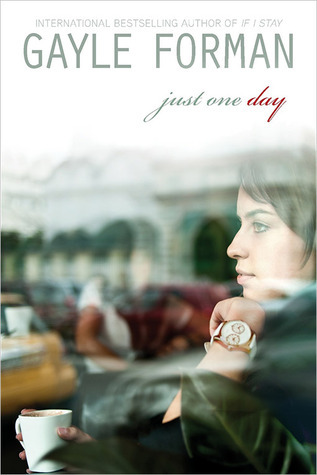 Just One Day by Gayle Forman was published January 8, 2013 by Dutton Juvenile. Ink and Page picked this book up from the library, so no one had a choice about whether it was reviewed.